I applied VS721 to the entire bottom of my Formula 350CBR last night with an orbital buffer. In 2 hours it had not dried so I left it overnight – it is dry now. 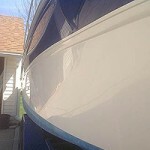 Buffing is more work than I anticipated – do I have to wait 24 hours after I finish buffing to apply the second coat or can I apply the second coat 24 hours after I finished applying the first coat last night (ie tomorrow morning). There are a lot of folks here at the marina that can’t wait to see if your product works as advertised so I want to make sure I do it right! (But I’d also like to get the boat in the water on Friday. You can apply the 2nd coat 24 hours after applying the 1st. 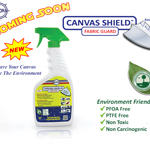 VS721 does not have to dry completely, just haze up. That’s the proper time to wipe off the haze and buff if you wish. 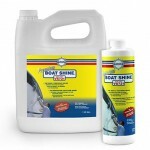 Buffing the haze is usually not necessary, unless you are after the highest shine possible. 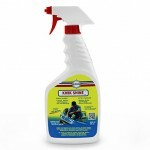 It’s self-polishing, which means that you only have to wipe away the haze and let it do the work by itself. When it starts to haze, that’s the indication that it’s starting to cure. The curing process will continue over a 14 day period, at which time it will be its hardest and slipperiest. The reason for allowing 24 hours between coats is to allow the 1st coat to cure sufficiently so that the 2nd coat does not remove the 1st and you layer one coat over the previous, instead of removing one coat and replacing it with the 2nd. Now that you’ve let it cure overnight, I suggest that you apply the 2nd coat with a sponge and buff it off within about 15 to 20 minutes. Work on one section at a time so you can remove the haze before it dries too much. The solvents in the 2nd coat will loosen up the surface haze to make buffing easier. 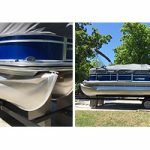 For maximum durability, allow the final coat to cure for 48 hours before launching the boat.